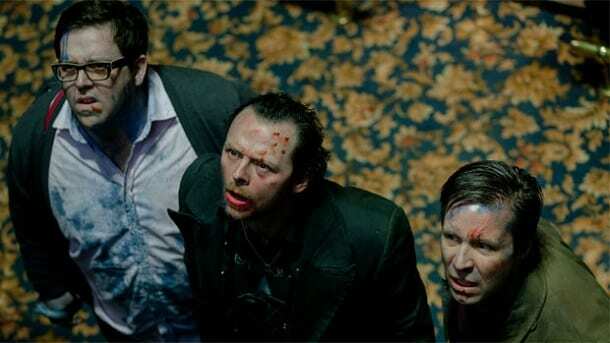 The latest film from the pairing of Simon Pegg and Edgar Wright, The World’s End (2013), completes their ‘The Blood and Ice Cream Trilogy’ which consisted of Shaun of the Dead (2004) and Hot Fuzz (2007). It is no secret that these two love working together and their films have parachuted them to international acclaim. Wright and Pegg have become established British comedy writers and seem to have a formula for success. With the inclusion of friend and actor Nick Frost, as well as an all-star English cast, the film had the potential to be one of the best UK films of the year, unfortunately this wasn’t the case. The films story is led by the one and only Gary King (Simon Pegg), the typical jack-the-lad, who cherished his childhood and hasn’t been able to let it go. After failing to complete the ‘Golden Mile’ 20 years earlier with his 4 best mates, he decides it’s time for a reunion and he begins to assemble the cast back to their hometown of Newton Haven. King rallies the troops and the ‘five musketeers’, Andy (Nick Frost), Oliver (Martin Freeman), Peter (Eddie Marsan) and Steven (Paddy Considine), reluctantly begin the 12-pint pub crawl. However, all is not as it seems in their hometown and they realise something rather odd has happened to their old watering holes. Nevertheless, they battle through like the young boys they once were and find themselves in a situation of unprecedented abnormality. The star-studded cast portray their friendship with uncompromising ease. The experience of Pegg, Frost, Marsan, Freeman, who has excelled in previous years, and Considine all add to the jovial spirit in their own characteristic way, which I don’t believe is far from their own persona. Pegg and writer, Edgar Wright, articulated a mediocre script which plays to the strengths of the characters and the comedy is probably the films only saving grace. As for The World’s Ends’ narrative, it is particularly far-fetched. I enjoyed both Shaun of the Dead and Hot Fuzz, and I’m not saying these films are completely non-fictional, but I thought in their latest project they took the story beyond absurdity. This might be due to the fact I expected so much from this pairing after their last two films but I felt disappointed as the comedy usually compensates for the outlandish story-line. However, in this instance that was not the case and I left feeling somewhat dissatisfied.